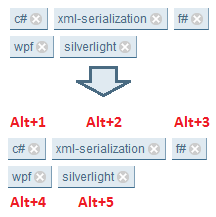 Another short and simple script, it adds numerical keyboard shortcuts to the favourite tags. Only works on those pages which have the favourite tags on them. The default modifier is Alt but the boolean expression at line 43 can easily be changed to some other modifier key combination.